Just a quick reminder that tomorrow is my big giveaway event! Every hour from 9am-6pm tomorrow I will be featuring a new shop with a giveaway. I have some FABULOUS shops lined up and some amazing prizes! It will be the perfect opportunity to get some Christmas shopping done and maybe even win a prize or two. Tell all your friends and see ya here tomorrow. You won't want to miss it! I know this is super last minute, but I wanted to come up with a little craft for my kids to do on Thanksgiving while we cook. My thought was that if I could come up something that helped them feel apart of the preparations, maybe they would actually appreciate enjoy the feast more. So I made these little turkey place cards for them to color. All you need to do is save the image, print it on card stock and let the kids color. You can either put everyone's name on the cards or have the kids write things they are thankful for. Then cut them out, tape them into a ring and use as either a place card or napkin ring. I made up one as an example. For this one I just opened the file in MS Paint and colored it that way. Here is how they look all made up. I'm sure the kids will have fun making them and it will be cute to see how they color them. Just click to view it larger and then save the image. They are created to be printed on a regular letter size paper. And here is the one I already colored in case you don't have kids to color them for you. :) But once again, if you want to do your own colors just open the black and white version in paint and have fun! I do ask that you please be a follower of this blog before using these files. 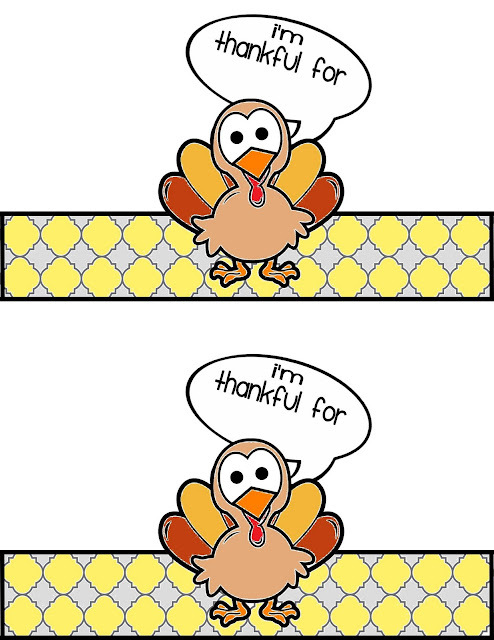 And I also want to credit Homemade Preschool for the cute Turkey I used in these printable. I hope you enjoy and Happy Thanksgiving!!! In case you missed it last week, here is my post for WYLTC. This month's theme was "family" and everyone shared some seriously cute stuff, so be sure to head on over and check them all out. Also, the "family" link party is going on now so be sure to play along and link up! We can't wait to see what you made! Hello! Its Krystal from Sassy Sanctuary here today! 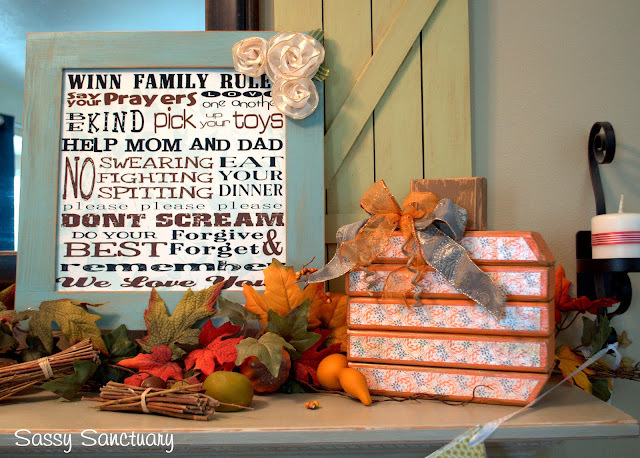 I'm so excited to show you guys my take on Wendy's adorable Family Rules Sign. To be honest, I was a little nervous about this months project because we are in the process of moving to another state and my husband has packed up all the tools and moved them to our new house! So I knew that whatever I made, I was going to have to take some help from the craft store. There is nothing wrong in that right?! So I went to one of my favorite local stores. (It's called Porter's if any of you have one near you) and found a 12x12 unfinished MDF frame that had a 4x4 opening. I grabbed that and went to see if I could find some scrapbook paper inspiration and found one of those 5x7 paper packs in adorable prints. Then a light bulb went off in my head! I wanted to make 4x4 compartments and use each square to place a quote. Then thanks to pinterest I found the PERFECT family motto to put in my frame. So, do you want to make your own? This is how I did it. A- First get a 12x12 frame with a 4x4 opening. 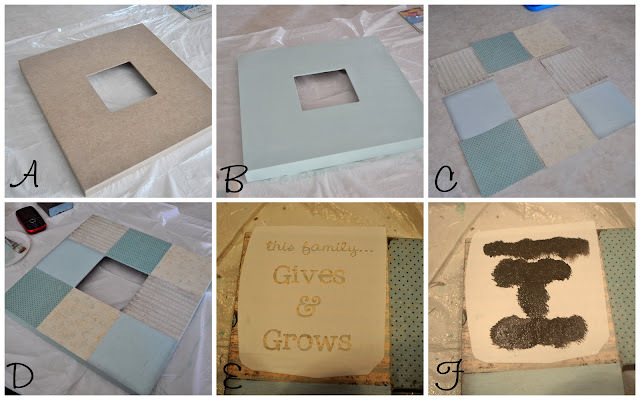 C- Cut your papers to 4x4 squares and arrange them how you would like them on your frame. D- Modge Podge the paper on. I found it best to do the corners first and then the middle squares. F- Paint your text. I found it turned out better if I let my paint dry to the touch before removing my stencil. Oh.... but you may have noticed that my frame has a good amount of distressing. I walked away from this project to use the bathroom after doing the text in one square.... and left it and my paint sitting on the counter. (Do you see where this is going?) When I came back my 3 year old daughter had painted brown paint all over it! Then I got a rag and scrubbed the thing off. Luckily the modge podge sealed it pretty well and most of the paint came off... Except for in a few spots where I scrubbed through the paper! Once I regained my composure I decided to just go with it. I strategically scrapped up the surface of the paper (just using my fingernails) and rubbed brown paint into the scratches. I actually LOVE the way it looks. So yay for happy accidents! So anyway... thats it. My family motto picture frame. One of my friends is the Cub Scout Master in our ward. She wanted to come up with an easy but special gift to give to all the scout leaders for Christmas. Her words were... "I just know you can come up with something cute." So I'm going to give myself away and expose the secret to my cleverness..... but I'm sure all of you already know my secret. So if any of you are looking for some easy gifts to give to friends, neighbors, or extended family... here ya go! I just realized I forgot to show you guys how my Thanksgiving mantle turned out! Its basically the same as my Halloween one, just with a few tweaks. My turkey is the star of the show. I found the 'Give Thanks' block in my stash and thought it looked great with Mr. Turkey. He is sitting by one of my 2x4 pumpkins. My other pumpkin sits on the other side with my Family Rules print. As I'm sure all of you are aware, this week was the unofficial pinterest challenge, so everyone would stop pinning and start doing! I hadn't planned on playing along... way to much going on. But last night I got bored and was having crafting withdrawal. 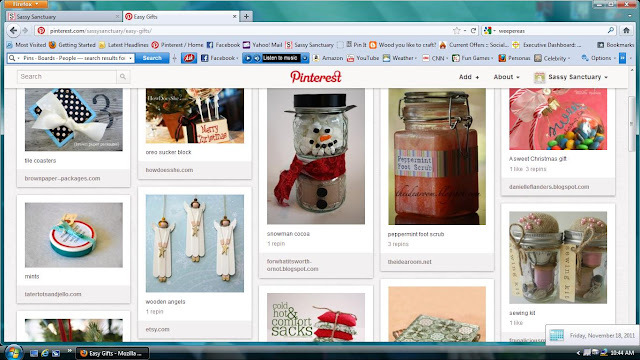 So I went to pinterest to see if there was something I could make using things I already owned in only a few hours. I decided on this Turkey from The Wood Connection. Anyway, since the wood connection is a shop that sells kits, I didn't do a tutorial. But I will say I had this turkey made from scrap wood in the garage, complete in under 2 hours. So its fun and easy! If you don't have power tools, just get their kit. I just used one paper for the back feathers. (since I was using what I had) I also didn't have any bead-board (which I loved) for the front feathers, but its still cute. For that part I just stained the wood and then rubbed some blue paint on it to give it a blue hue. Unfortunately I am too late to link it up to the Pinterest Challenge. Boo. But I thought I'd share a few of my favorite links from other people who played along. 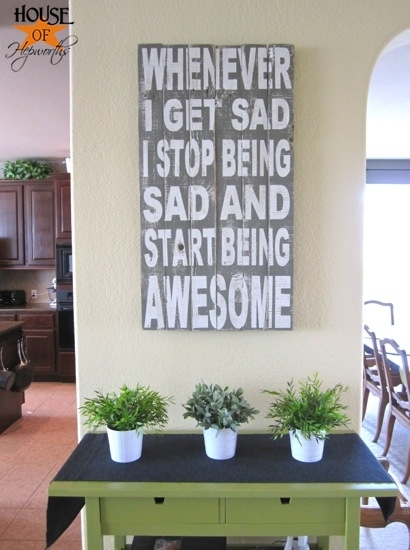 First up, House of Hepworths made this "start being awesome" sign. I love it! She has a great tutorial on how to make it too, so check it out! Nonsense turned a coffee table into a bench. I have the perfect spot for a bench like this in my new house so it was fun seeing how hers was done. Cute too! So much fun! 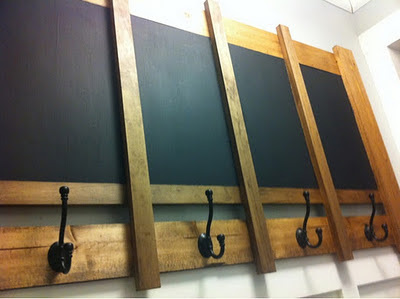 I just love the inspiration you can find on pinterest, but its even more fun to see that inspiration become a reality! So, did you guys play along? I'd love to see what you made!